For the provincial riding, see Nanaimo-North Cowichan. 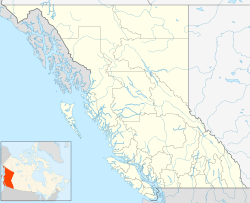 North Cowichan (Canada 2016 Census population 29,676) is a District municipality established in 1873 located on Vancouver Island in British Columbia, Canada. The municipality is part of the Cowichan Valley Regional District. North Cowichan is noted for a landscape including forests, beaches, rivers and lakes. The municipality encompasses the communities of Crofton, Chemainus, Maple Bay and the 'south end' which is essentially a suburb of the City of Duncan. 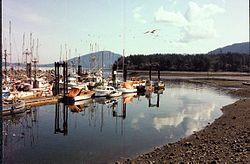 Located on the east coast of southern Vancouver Island, North Cowichan is centrally located immediately north of and adjacent to the city of Duncan and south of Ladysmith. Spanning 193.98 square kilometers, North Cowichan includes the communities of Chemainus, Crofton, Westholme, Maple Bay and the so-called "South End" which is functionally a suburb of Duncan. The last glacial period, the Fraser Glaciation occurred between 29,000 and 15,000 years ago. The glaciers that formed carved out the Cowichan Valley and left behind glaciers up to 30 metres thick. These fertile lands and mild climate have led to a history rich in agriculture. Sheltered by the mountains of the central Island and the Olympic Peninsula, North Cowichan has a temperate, Mediterranean-like climate, with mild, damp winters with little snowfall and warm, dry summers. North Cowichan is classified as a warm-summer mediterranean climate Csb by the Köppen system. North Cowichan has a population of 27,557 people in 2006, which was an increase of 5.4% from the 2001 census count. The median family income in 2006 for North Cowichan was $62,125, which is below the British Columbia provincial average of $65,787. North Cowichan is serviced by the Maple Bay Airport (YAQ), which offers services to Vancouver Downtown, Vancouver Airport, Ganges on Salt Spring Island and Bedwell Harbour on Pender Island. Service is provided by Saltspring Air and Harbour Air. The British Columbia Highway 1 traverses the municipality as a four lane divided highway with signals at major intersections. British Columbia Highway 18 connects North Cowichan to Lake Cowichan. Bus service in the municipality is provided by the Cowichan Valley Regional District. The original economic drivers steamed from the abundance of natural resources, including the fur trade, fishing, mining, and the forest industry. Today, the forest industry, retail, construction, manufacturing, and health care are large contributors to the local economy. North Cowichan lies within the School District 79 Cowichan Valley. There are many elementary schools, two middle schools, and two secondary schools. North Cowichan is served by one public post secondary educational institution, Vancouver Island University. North Cowichan is served by three newspapers – the Duncan Journal <http://www.duncanjournal.ca>, the Cowichan Valley Citizen, and the Chemainus Valley Courier. North Cowichan is also serviced by 89.7 JuiceFM, a member of Vista Radio. North Cowichan is home to the BC Forest Discovery Centre, the Pacific Northwest Raptors Bird of Prey and Raptor Visitor Center, and the world famous Chemainus Murals. The Cowichan Theatre hosts many performers and shows during the year. The Chemainus Theatre Festival features classic and award winning comedies, musicals and dramas. North Cowichan is home to many recreation centres, including the Cowichan Aquatic Centre, Island Savings Centre, Fuller Lake Arena and the Cowichan Sportsplex. North Cowichan offers numerous parks and hiking trails. The Vancouver Island terminal of the HVDC Vancouver-Island is found here. ^ "Geological History of Vancouver Island". CVRD. CVRD. ^ The Weather Network—Statistics: Duncan, BC. Retrieved 29 September 2011. ^ "British Columbia — Community Fact" (PDF). Archived from the original (PDF) on 2006-02-15. Retrieved 2010-11-29. This page was last edited on 11 January 2019, at 01:35 (UTC).